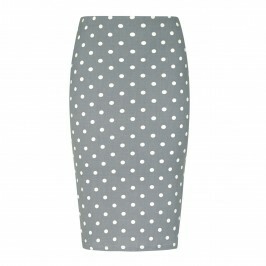 In a soft shade of dove grey, this polka dot top by Yoek is a firm favourite at Beige. We love the elbow length sleeves and the draped neckline and waist make it so flattering. Pair with the matching skirt and tonal heels for an elegant ensemble. Grey polka dot silky jersey drape neck top. 95% Polyester, 5% Elastane. Delicate Machine Wash or Dry Clean Inside Out.